Contracts IT awarded a Two Ticks disability symbol. 25 Apr Contracts IT awarded a Two Ticks disability symbol. 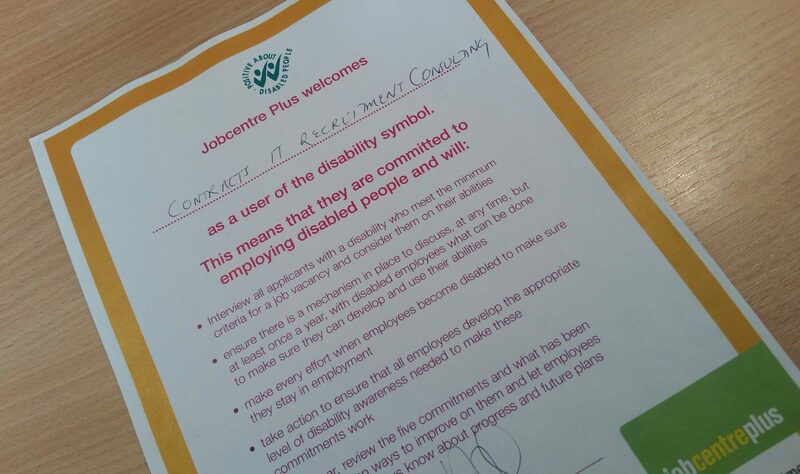 Contracts IT have been awarded the Two Ticks disability symbol by Jobcentre Plus, part of the Department for Work and Pensions. We are proud to be promoting an inclusive culture within our own organisation as well as partnering with our clients across Europe and the US who are at various stages with workforce diversity strategies, supporting them with cultural change. – to review these commitments every year and assess what has been achieved, plan ways to improve on them and let employees and Jobcentre Plus know about progress and future plans. Contracts IT are passionate about promoting Diversity and Inclusion within our organisation and with our clients.